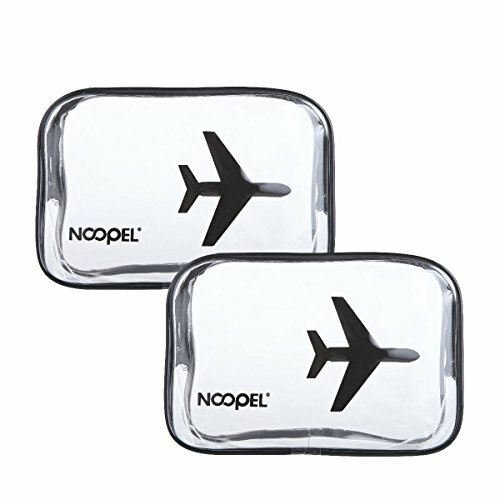 Noopel TSA Approved Toiletry Bag (7L*2W*5H inch), complies with the 3-1-1 rule for TSA screening. Great for travel, gym, camping, hiking, bathroom organization, beach, swimming and more. Ideal organizer bags for all age: men, women, kids, children, teenage boys, teenage girls. make huge different from other poor quality cheap transparent makeup bag. Airline toiletry bags are transparent, easy to check and find your items with clear color design. Save your time for pleasant journey. This pouch can be used as small storage bag for home, travel, office or school. phone chargers, house keys, USB cables, other small items of your choosing. Noopel provides 100% customer satisfaction guarantee, 1-year warranty and 24*7 customer support. TSA Approved- Travel toiletry bag (7L*2W*5H inch) meets TSA 3-1-1 rules and safety regulations of all airlines. Fast and Easy to pass through airport security. Save your time. Durable and Reusable-High quality PVC and strong heavy duty zipper built for long-term use. Easy to clean and dry fast. Waterproof Secure-Advanced high temperature pressing technology make the mini clear toiletry bag not tear easily. Say goodbye to liquid leaking problem. Upgraded Zipper- Sturdy smooth zipper, large zipper opening and luxurious zipper puller make it easy open and pack. And it is corrosion-resistant. Versatile- An ideal carry on cosmetic pouch for all ages. Perfect for carrying shampoo, body wash, shaving cream, liquid soap, lotion, perfume, toothpaste, toothbrush, comb and other toiletries.